inches photos inches of Big Bird?s friend, Elmo! Smile and say cheese, please! 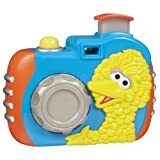 This adorable pretend Playskool Sesame Street Big Bird Camera features a real working flash, fun sound effects, funny phrases and best of all – “photos” of Big Bird’s friend, Elmo!